A quick trip to Perth to pick up some kilt sox for the wedding on Friday – not mine I hasten to add. Disappointing lunch in Cafe Tabou. Only the second bad lunch I’ve had there. Remind me not to have beef cheek there again. Managed an hour in St Mo’s. Saw one of the deer with what looked like a fawn. Must try to get a better photo tomorrow, because Friday will be a wedding fest! Back home then into Glasgow to salsa. Motorway was mobbed on the way home so had to rely on the satnav on the phone to get me out of difficulty and find a way through the backstreets on to the motorway at ASDA. What would we do without this technology now? 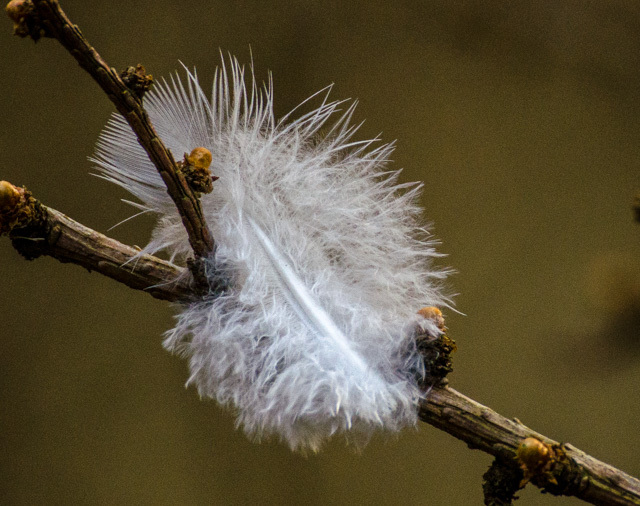 Feather trapped on a larch branch. St Mo’s.